After studying Art and Design at Salisbury College of Art, Kevin Safe worked for various graphic design companies. He was, however, drawn towards an artistic career and now paints full time. Kevin has found and developed a distinctive style that is very strong in colour and texture. 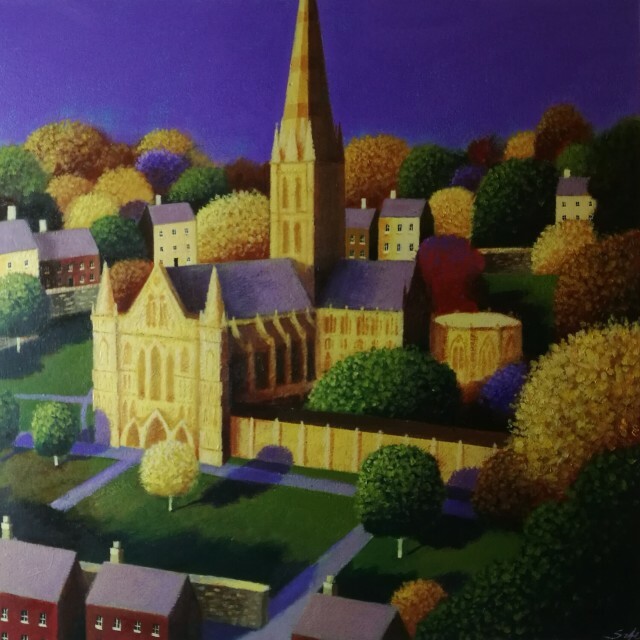 His heart lies in contemporary landscape and he produces images based on the vast landscapes of Wiltshire and the tall Georgian buildings of Bristol and Bath. Using acrylics on board he incorporates texture, along with scraping and sanding back to achieve his effects. Kevin cites Francis Bacon and Gustav Klimt as early influences on his distinct and dramatic style, which is simple and bold. By enjoying the world around him with its intricate textures and forms he hopes to create timeless, narrative paintings which are fresh and exciting at the same time. Kevin has exhibited regularly in London, Bath, Wales and the South of England.